Pre parations are in full swing for the next youth exchange in the CADFA Ma’an-Together project which will take place later in September. 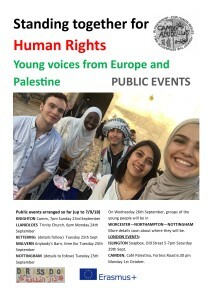 The first two youth exchanges in this project were in France in October last year and in Palestine in April this year – this exchange in the UK draws on the discussions of anti-discrimination and human rights during those projects and will focus on 2getting our voice outwards” – so there will be public meetings and work on media. It’s an interesting time to be concentrating on speaking out, given current political pressures – We’ll discuss this all with the participants and are sure they will have a lot to say! Come if you can and join them at one of the public meetings in Knighton, Llanidloes, Kettering, Northampton, Worcester, Nottingham, Islington and Camden! Posted on September 7, 2018 by CADFA.